1 J None No Power Seat 1 J is a standard Business Class Bulkhead seat. There is no floor storage for this seat during take-off or landing. 1 L None No Power Seat 1 L is a standard Business Class Bulkhead seat. There is no floor storage for this seat during take-off or landing. 30 B None No Power Seat 30 B is an Economy Class Exit Row seat with extra legroom. The tray table is in the armrest, making the armrest immovable and slightly reducing seat width. There is no floor storage for this seat during take-off or landing. Couples often prefer sitting in this row as it is one of few twosomes on the aircraft. There is extra storage near the window, but you cannot lean your head to sleep. 30 C None No Power Seat 30 C is an Economy Class Exit Row seat with extra legroom. The tray table is in the armrest, making the armrest immovable and slightly reducing seat width. There is no floor storage for this seat during take-off or landing. Couples often prefer sitting in this row as it is one of few twosomes on the aircraft. There is extra storage near the window, but you cannot lean your head to sleep. 30 J None No Power Seat 30 J is an Economy Class Exit Row seat with extra legroom. The tray table is in the armrest, making the armrest immovable and slightly reducing seat width. There is no floor storage for this seat during take-off or landing. Couples often prefer sitting in this row as it is one of few twosomes on the aircraft. There is extra storage near the window, but you cannot lean your head to sleep. 30 K None No Power Seat 30 K is an Economy Class Exit Row seat with extra legroom. The tray table is in the armrest, making the armrest immovable and slightly reducing seat width. There is no floor storage for this seat during take-off or landing. Couples often prefer sitting in this row as it is one of few twosomes on the aircraft. There is extra storage near the window, but you cannot lean your head to sleep. 31 A None No Power Seat 31 A is an Economy Class Exit Row seat with extra legroom due to the missing seat in front. The tray table is in the armrest, making the armrest immovable and slightly reducing seat width. There is no floor storage for this seat during take-off or landing. 31 L None No Power Seat 31 L is an Economy Class Exit Row seat with extra legroom due to the missing seat in front. The tray table is in the armrest, making the armrest immovable and slightly reducing seat width. There is no floor storage for this seat during take-off or landing. 42 A None No Power Seat 42 A is an Economy Class seat that may not recline due to the Exit Row behind. 42 B None No Power Seat 42 B is an Economy Class seat that may not recline due to the Exit Row behind. 42 C None No Power Seat 42 C is an Economy Class seat that may not recline due to the Exit Row behind. 42 J None No Power Seat 42 J is an Economy Class seat that may not recline due to the Exit Row behind. Couples often prefer sitting in this row as it is one of few twosomes on the aircraft. There is extra storage near the window, but you cannot lean your head to sleep. 42 K None No Power Seat 42 K is an Economy Class seat that may not recline due to the Exit Row behind. Couples often prefer sitting in this row as it is one of few twosomes on the aircraft. There is extra storage near the window, but you cannot lean your head to sleep. 43 B None No Power Seat 43 B is an Economy Class Exit Row seat with extra legroom. The tray table is in the armrest, making the armrest immovable and slightly reducing seat width. There is no floor storage for this seat during take-off or landing. Couples often prefer sitting in this row as it is one of few twosomes on the aircraft. There is extra storage near the window, but you cannot lean your head to sleep. 43 C None No Power Seat 43 C is an Economy Class Exit Row seat with extra legroom. The tray table is in the armrest, making the armrest immovable and slightly reducing seat width. There is no floor storage for this seat during take-off or landing. Couples often prefer sitting in this row as it is one of few twosomes on the aircraft. There is extra storage near the window, but you cannot lean your head to sleep. 43 J None No Power Seat 43 J is an Economy Class Exit Row seat with extra legroom. The tray table is in the armrest, making the armrest immovable and slightly reducing seat width. There is no floor storage for this seat during take-off or landing. Couples often prefer sitting in this row as it is one of few twosomes on the aircraft. There is extra storage near the window, but you cannot lean your head to sleep. 43 K None No Power Seat 43 K is an Economy Class Exit Row seat with extra legroom. The tray table is in the armrest, making the armrest immovable and slightly reducing seat width. There is no floor storage for this seat during take-off or landing. Couples often prefer sitting in this row as it is one of few twosomes on the aircraft. There is extra storage near the window, but you cannot lean your head to sleep. 54 A None No Power Seat 54 A is an Economy Class seat in the last row of the plane that may have limited recline. The close proximity to the lavatories and galley may be bothersome. 54 B None No Power Seat 54 B is an Economy Class seat in the last row of the plane that may have limited recline. The close proximity to the lavatories and galley may be bothersome. 54 C None No Power Seat 54 C is an Economy Class seat in the last row of the plane that may have limited recline. The close proximity to the lavatories and galley may be bothersome. 54 J None No Power Seat 54 J is an Economy Class seat in the last row of the plane that may have limited recline. The close proximity to the lavatories and galley may be bothersome. 54 K None No Power Seat 54 K is an Economy Class seat in the last row of the plane that may have limited recline. The close proximity to the lavatories and galley may be bothersome. 54 L None No Power Seat 54 L is an Economy Class seat in the last row of the plane that may have limited recline. The close proximity to the lavatories and galley may be bothersome. 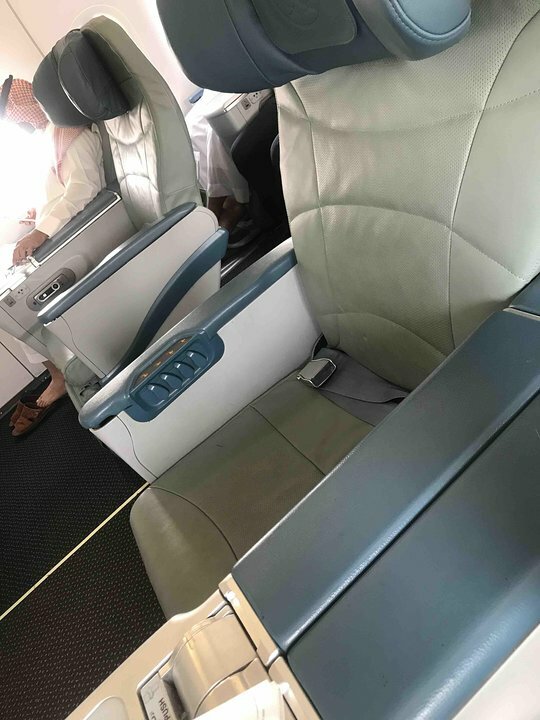 All Business seats have personal seat-back TV screens featuring AVOD (Audio Video On-Demand) with a selection of movies, music, and video games. Economy Class has standard audio channels. All Business Class seats have personal seat-back TV screens featuring AVOD (Audio Video On-Demand) with a selection of movies, music, and video games. There are overhead screens in Economy Class. Saudia Airlines flies the Airbus A321 with 165 seats in a two-class configuration of Business and Economy. Guest Class is Saudia's Economy Class product. There are 15 of this aircraft in the Saudia fleet. If you are big at all, this seat is terrible. While yes, it does have nice leg room, having the tray tables in the arm rests make this seat an immovable box. DO NOT SIT HERE. Saudia flies 1 versions of Airbus A321.